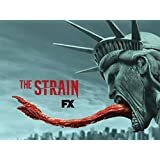 The Blogboard Jungle: The Strain catch-up: Big Red Worm! The Strain catch-up: Big Red Worm! Everybody has a plan for their own personal win. That is what this season of The Strain has shown us so far, with the exception of Setrakian and Fet who are fighting for mankind. Both Eph and Quinlan sort of unite since their goals more closely align. The Lumen gets stolen, to lure The Master so Quinlan can kill him and Eph can save his son. What comes of their plan reveals a lot about The Master and Quinlan's past. First, we know more about why Quinlan is not like the other "Stragoi", he's pretty much what Blade is to vampires in the Marvel Universe. He is also considered a part of a prophecy that is said to end The Master's plans. In his attempt to kill The Master, we see the true form of the Master. This disease is based on a hive mentality and all hives have a leader they follow, fans have known this since the first few episodes. Those little white worms, enter the bloodstream to make more white worms. In doing so, the host becomes a puppet controlled by the worms who are controlled by The Master, a big red worm. So now we know, to kill The Master you have to kill that big red worm not the body he/it inhabits. In the last episode the Stragoi suffer a major setback with The Master's encounter with Quinlan and Eph. They retaliate with the few Stragoi that can follow orders, apparently when The Master is without a host, he loses control of his army. In the final scene of last Sunday's episode, The Master addresses Eph through a random Stragoi and we know he has found a new host. Is it Zack? If so, Eph will me more unpredictable than before. Do you think that's why Zack is being kept alive? Please comment below.